When Australians competed in the 2014 Commonwealth Games, they sported outfits featuring maps of Australia that was missing one small thing – Tasmania. Something similar happened in the 1982 Brisbane Commonwealth Games when performers created the shape of Australia, excluding Tasmania. Being an island south of the Australian “mainland”, you could understand why the makers of fridge magnets may ignore Tasmania, but for Tasmanians this is evidence of Tasmania being forgotten about by the mainlanders again. Non-Tasmanians would never actually call themselves “mainlanders”, a term that I have only heard used in Tasmania, and it seems that for many mainlanders, there is little reason to think of Tasmania at all. When they do think of it, Tasmania is ridiculed as a backward oddity where people marry their cousin and have two heads. 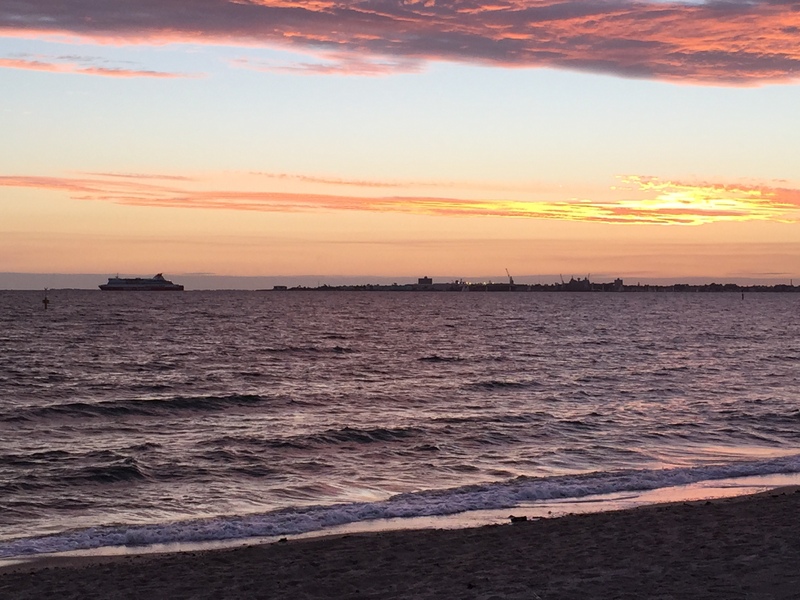 My interest in Tasmania sparked the first time I saw the Spirit of Tasmania ferry sail off into the sunset right in front of my house. Seeing this daily made me want to know to what kind of place attracted such spirit. I’ve since been twice, which appears to be twice more than most Australians, which makes it even easier to enjoy it as there is nobody else there. But all who have been, rave about the stunning landscapes, pristine beaches and mouth-watering seafood. 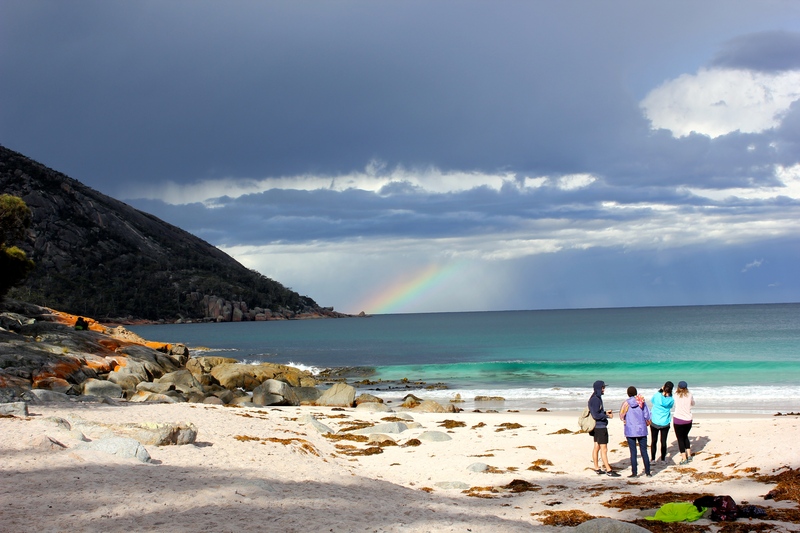 Wineglass Bay – you get there by walking up, over and down a hill, which is the least you can do to deserve being there really. We had a mix of thunderstorms and rainbows just to add to it. Bay of Fires is a series of bays of white sand, crystal water and rocks turned red from lichen clamping themselves on. Whilst most of Tasmania’s delights are what it is, rather than what has been built there, it also has Hobart. 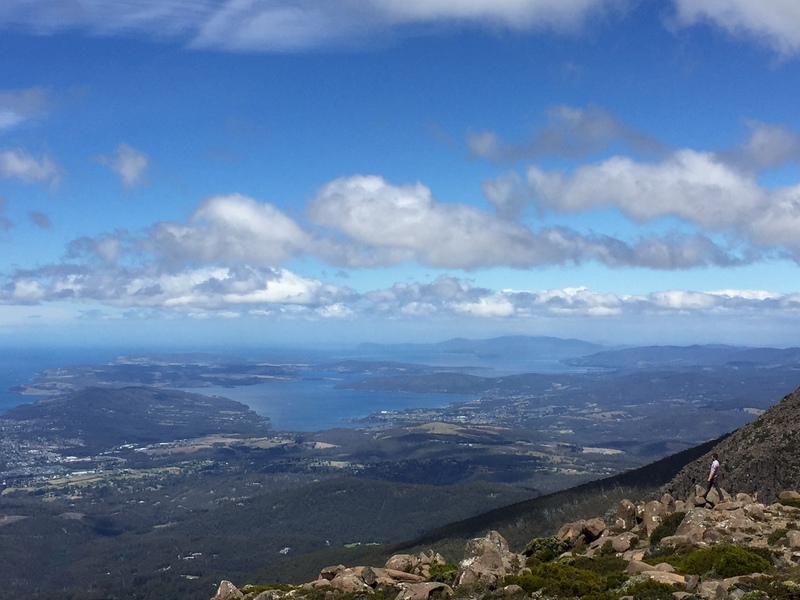 Hobart is a natural beauty with stunning topography viewed majestically from the top of Mount Wellington (1250m) just a 20 minute drive from the city centre. But it has added to this with a majestic bridge and a much talked about museum; the Museum of Old and New Art (MONA). MONA is owned and created by David Walsh, a man who has made millions from approaching betting like huge investment companies bet on the stock market. Like his love of mathematics, the museum seems more Californian than Australian. You can arrive there on a free boat from Hobart feeling like James Bond going to the futuristic lair of his nemesis. Adding to this feeling is the descent from ground level through layers of rock to the galleries. While the museum has some old art, its essence is the conceptual art, which Walsh has often commissioned or chosen himself. He often offers his own, entertaining take on why he chose a piece or artist and what he thinks its message is. After the museum, you can hang out in the winery or maybe even play tennis on the court right in front of the entrance. MONA is certainly unusual and Tasmania does have oddities, like the sniffer dog standing on the luggage carousel in full view of everybody rather than doing the drug catching business behind closed doors. But most oddities are pleasant surprises. It has wonderful whisky (Lark) and even had haggis in the deli for Burns Night. It has a growing number of vineyards producing award winning wine and poppy fields producing the world’s largest supply of heroine for medicinal purposes. The many surprises come from large diversity. Tasmania is a small island but has so much in it, possibly the opposite of mainland Australia, which is so big and often has nothing in it. 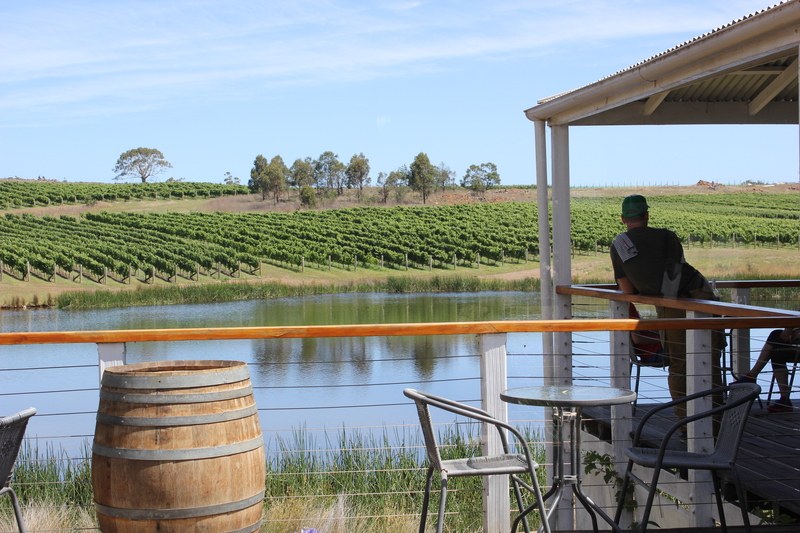 The landscape changes constantly and the multiple microclimates in Tasmania, the west coast gets four times as much rain as the east coast, ensures the flora and fauna do too. Tasmania appears to have everything you could want – maybe enough to justify a fridge magnet of its own. This entry was posted in Places of Australia and tagged bay, Bay of fires, Coles bay, Freycinet, Hobart, MONA, mount wellington, Museum of old and new art, seafood, Spirit, Tasmania, wineglass. Bookmark the permalink.